Book Six - "Book 6-01"
………..I don’t suppose we can get an advancement on the next page, can we? yes you can. just become a patron and you will get early access to upcoming pages. I really like her new aged up design. Good look with a solid outfit. That’s a cool-looking flying uniform here. But i feel you lost the chance to foreshadow some wonderbolt-esque uniform for her. Clearly that is her superhero uniform for the Amazing Ponygirl! With her amazing ability to turn into a mostly unassuming barn animal (bad guys always ignore the wings) she can infiltrate the lair of the dreaded Farmer Doom and his plans to conquer the world one grain of wheat at a time! ah ha ha ha! oh… oh that made me laugh so much. love it. That’s just the smell of droppings in Farmer Doom’s lair. Manure DOES make good fertilizer after all. Be sure to watch where you step BTW. I wonder how Grace will explain the wings when she returns to school, maybe she’ll say they’re robotic wings that her father made to help Grace reach school on time. Questions about said back are deflected with “I really shouldn’t describe it, I kind of promised,” “he finds it embarrassing, so don’t bring it up around him,” and such. Her teeth look very, *very* odd. 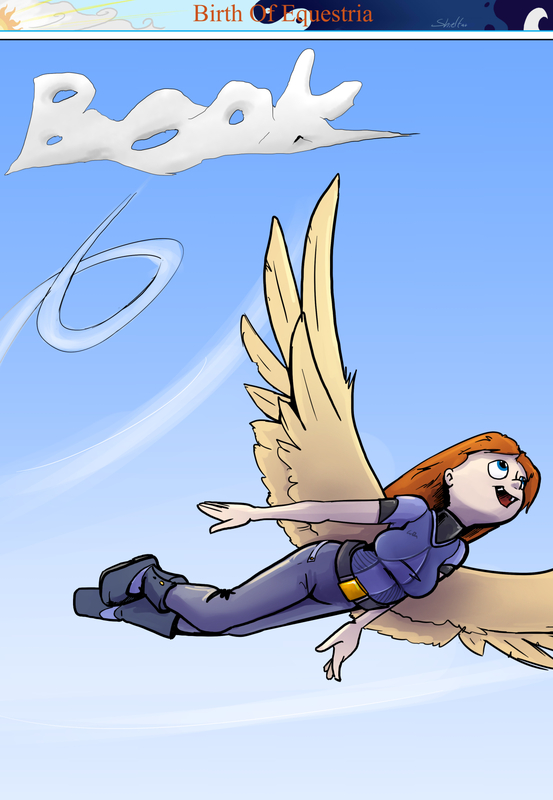 So, is Grace going to try her hands at being a magical superhero or is she just going to decide that she wants to ENJOY having wings? Probably because they are spread out for flight. When they are folded up they look higher. Her clothes are kinda reminiscent of the standard Alliance uniform worn by the crew of the Normandy in Mass Effect. Gonna get fined by FAA. Uniform looks like it belongs to the Z.P.D. Very Officer Hopps.